Training with positive reinforcement does not necessarily guarantee a positive training experience for the animal or that it always feels comfortable during training. If you only train with positive reinforcement because of effectiveness but disregard the animal’s emotions, you might not only miss the target and important opportunities to give animals more control during training but also ignore an important part of their basic needs. My desire for training with positive reinforcement is that we build a strong bond and positive communication as little intrusive and as stress-free as possible and accompanied by positive emotions. I want to create positive experiences and memories for horses and humans. My desire for training with positive reinforcement is that we build a strong bond and positive communication as little intrusive and as stress-free as possible and accompanied by positive emotions. I want to create positive experiences and memories for horses and humans. I feel the underlying emotions are one of the most important things in training and therefore they represent one of the cornerstones of my education. Those who have ever dealt more closely with positive reinforcement will soon notice that “clicking and feeding” is not as simple as it sounds. It requires an intense analysis of the method. And even then, it’s not yet certain that the training with positive reinforcement is also a positive training experience for the animal. In classical training approaches you often hear that the horse could leave or stop working if it wasn’t fun for him anymore. In fact, however, it’s often not possible for the horse to leave, because it has learned to expect unpleasant consequences. Unfortunately, you will hear these arguments in training with positive reinforcement too. Since the horse doesn’t have to worry about unpleasant physical consequences, it is assumed to automatically feel comfortable with performing the correct behavior. Well, training with positive reinforcement is still new in the animal world and the topic of “animal emotions” is not yet very consistently taught or commonly known. In addition, the original idea of training with positive reinforcement was primarily designed to train behavior reliably and fast, and not necessarily, because the animal feels better doing so. Therefore, it is not surprising that initially the conclusion that “positive consequences” also produce a positive feeling was easily reached. A necessary prerequisite to make the animal feel good and to avoid stress during training is the fulfillment of basic needs like food and water as well as the realization of social needs and movement. However, it regularly happens, that animals are stressed because of inadequate feeding and do things in training, they wouldn’t do without feeling as hungry while performing. But even when the horse is more satiated, one can put a lot of emotional pressure on them by using highly valued food, which makes the horse perform the behavior “anyway”. When training is done using negative punishment (actively going or turning away, removing the reinforcer, demanding more behavior or longer duration), or restraint (which is often a form of positive punishment, which means adding an unpleasant consequence) you will take away “choice” and “control” from the animal. Through body language and facial expressions of the horse, you will often recognize that it doesn’t feel well but is annoyed or anxious. Of course you can say that as long as the horse is still taking the treat or another reinforcer, it doesn’t feel stressed enough to make it relevant for the trainer or even the behavior. But with that perspective, one will literally take the modern approach of positive reinforcement “ad absurdum”, because for me, it’s not just about effectiveness, but also about good feelings and emotions within a horse-human-bond. For the animal, it will become crucial long before it becomes crucial for the trainer, if he only focuses on the behavior itself. I don’t think that you can completely avoid all (negative) stress. Sometimes stress arises during a process of getting used to new things, or quite unexpectedly and unintentionally. But I strictly try to avoid stress, that is produced due to the loss of control, (and this can for example happen, because the receiving of the reinforcer seems to be arbitrary for the animal) – because this simply violates my own ethical standards. In our modern world, we mostly take away the control of the horse, so we should focus on giving control back to the animal – and we CAN do it by being aware of the signs they give us, not only by making them perform what we want them to do without taking care of their emotions. Far too often people talk about behavior, regardless of the emotions involved. However, behavior is always associated with a corresponding emotion – otherwise it is not possible, since a consequence always triggers a corresponding emotion. Behavior is rarely “neutral” on an emotional level – so it’s important to talk about it and analyze behavior on two levels: behavioral and emotional. For me, training happens on the base of behavior, because that is what we can see: the outer behavior which the animal actively shows. And that is ultimately what we need. We don’t communicate telepathically. We can not capture or click an emotion without a behavior, because we simply cannot see it without the horse showing that kind of behavior. So there is the behavior that the horse is actively showing (e.g. standing still, trotting at a certain pace or something comparable, operantly conditioned) and the body language of the animal, gestures and facial expressions, the unconscious “private” or innate behavior that results from the emotion. Training is always two-sided and not a one-way street: emotions occur due to behavior (which is influenced by the environment, for example conditioned during the training process, triggered by external stimuli, by cues, by behavior of the trainer, other circumstances, influenced by basic needs, etc ) and behavior can be an expression of the emotional state of the animal. After all, emotions are just one way for the body to react to external stimuli or to deal with internal processes. If we influence emotions through “training” in the broadest sense – and we basically do that -, it is even more important to know about the training processes and understand what they cause “inside the animal”. For example, frustration in training is often found in the emotional chapter “RAGE/ANGER” and typically arises in situations in which the animal can’t fulfill the requirements or simply doesn’t understand them, because the training steps are too big. Let’s look at another example: If I train a behavior and often reward the same behavior/criterion at the beginning of the training process and then suddenly stop rewarding because I want the horse to do “my next intended training step,” frustration arises and extinction happens and produces an extinction burst: behavior changes, usually intensified, due to frustration. If I click this behavior, it is very likely that the corresponding emotion manifests itself, because the animal still associates the behavior with the corresponding consequence and everything that depends on it. It may continue to perform the behavior, but maybe it will think something like “If I’m doing something wrong, maybe my treat will disappear.” or in a more scientific language “the horse doesn’t have control of its output because the consequences are arbitrarily chosen by the human”. Therefore, very small training steps without uncertainty are often preferable to large training steps – splitting not lumping. As you can see, the topic is very complex and not easy to understand nor explain in just a small article. It is worthwhile to deal with it and to think about it for a while. Ensure the fulfillment of basic needs! At least at the second “error” go into analysing and revise your plan and suspend the training > initiate a training break by offering an alternative for the horse, for example grazing, eating hay, walking around, being scratched or having fun with other horses)• Always observe the horses gestures and facial expressions closely and interprete them well > train your eye! Pay attention to whether the behavior changes in promptness or speed, because this is often an indication of how well the animal feels right now > The horse should always be expected to properly and promptly perform the behavior to get the reinforcer. That is an economic way of behavior! Behavior always has a function and is correct from the horse’s point of view. A mistake is always an information that the animal finds this behavior right at the moment and more important than the one we want. So don’t waste the information the horse gives you through an occuring mistake. 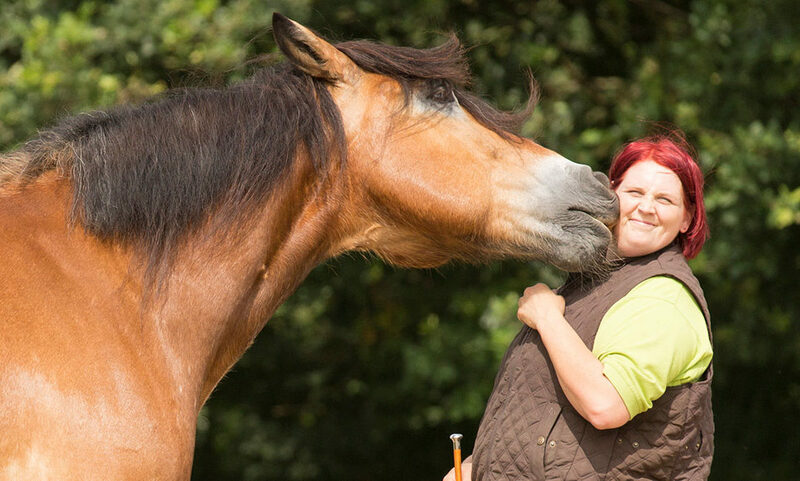 Let’s make the horse world a little bit better by providing our horses with more choice, more control and the opportunity to learn in the least intrusive and stress-free way possible. you'll never miss the latest posts!